Busy auto body and repair shops should use a system that includes service department vehicle ID tags in order to stay organized. To make your dispatch system efficient, Estampe has a large selection of both custom and stock dispatch. 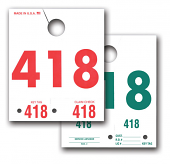 All of our auto service dispatch numbers are printed on strong, long lasting heavy paper stock with large die cut holes to easily fit on rear view mirrors. 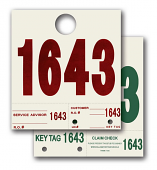 Many auto body and repair shops use auto service dispatch numbers with the econo arrow key id tags auto dealer key tag. This econo arrow key id tag is easy to staple to the auto service dispatch numbers for safe keeping. 2) Can be color coded to match a service writer or service team. 3) Can be used to indicate the status of the repair - green means that the work is finished - red means the work is not completed yet. 4) Dispatch numbers include a claim check that the customer keeps and presents when they return to pickup the vehicle. This allows your auto body or repair shop to quickly match the claim check number with the key and vehicle.